Did you know acne affects over 40 million Americans? And that it’s the single most common condition we see in our office? True on both accounts. 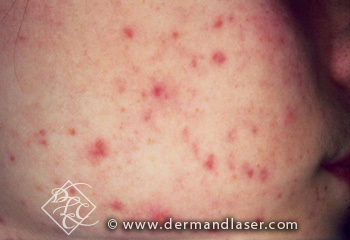 But, did you also know that it’s very common for acne to affect individuals well into their 40s? Unfortunately, that’s true as well. It’s a common misconception that acne happens only to teens and people in their early 20s. The reality, though, is acne can continue to wreak havoc on your skin well beyond the status of young adulthood in both men and women alike. It’s the frustration that keeps knockin’ on your door, but do not fret – we are here to help! Acne can also be triggered by hormones and lifestyle factors. Many recent studies have linked acne to dairy allergies. And while this has also been heavily debated, it is an option to reduce your dairy intake and observe how your skin reacts. You may also notice an acne outbreak if you find yourself under a lot of stress. (Because that’s exactly what everyone needs when stressed out, right?) This is how the two are linked – When you are stressed, the body produces cortisol, among other hormones, that signal the body to increase oil production which can lead to acne and other skin conditions. Do you or your child suffer from moderate acne? Check out our latest Acne Study and see if you qualify! Many factors can be involved with triggering acne at all ages, but on the flip side there’s just as many different treatment options available. It could be something as simple as switching your cleanser to one containing a salicylic or glycolic acid or exchanging your moisturizer or sunscreen for one that is noncomedogenic (aka: it doesn’t clog your pores). Night time retinoids are also effective in treating on-going acne and reducing the occurrence of future breakouts. Prescription topical or oral medication is also available, depending on the severity of your case. While this all can seem overwhelming, especially if you happen to be standing in the cosmetic aisle in any drug store, the silver lining when it comes to acne is the many treatment options available can be tailored to your specific needs and still be cost-effective. What you used as a spot treatment at age 24 may not be quite as effective at 37, and vice versa. Remember that patience is key when combating acne as you may need to try a few different treatment options before finding the golden ticket when it comes to your skin. Maybe it’s the occasional pimple, the cyst that creeps up days before a big event, or the seemingly uncontrollable breakouts on your face, chest, or back – whatever the case, our team of board-certified dermatologists have worked to get all instances of acne under control. No matter what you may think after trying your 3rd astringent or miracle spot treatment cream – there’s no helpless scenario when you’re living with acne! So the question is, are you ready to get your acne (and your frustrations with it) under control?